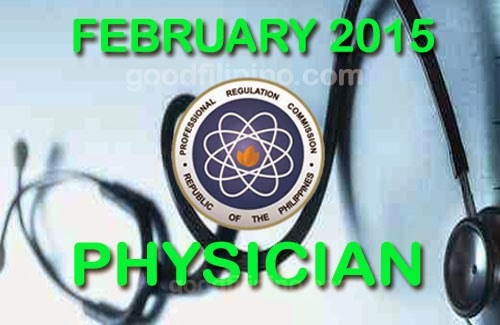 The Professional Regulation Commission released the February 2015 Physicians Licensure Examination on February 18. PRC made the official results available online and you may also view on this page. The Board of Medicine members who gave the licensure examination are Dr. Miguel L. Noche Jr., Chairman; then Dr. Edgardo T. Fernando, Dr. Restituto C. De Ocampo, Dr. Jose Y. Cueto, Jr., and Dr. Mildred N. Pareja, the Members. PRC announced the 594 out of 832 passed the Physician Licensure Examination given by the Board of Medicine. The Board gave this Physician Licensure Examination in the cities of Manila & Cebu in four (4) consecutive days, such as February 8, 9, 15 and 16, 2015. Usually, the results were released by the Commission in four (4) working days from the last day of examination. So expect that the official results will become available on February 20. Aside from that, PRC also make the announcement of the date and venue for the oathtaking ceremony of the new successful examinees in the said examination later or after they're released the exam results. You might want to view here the Top 10 Passers of February 2015 Medical Board Exam. Comments or suggestions about "February 2015 Medical Board Exam Results - Physician Licensure Examination Passers Feb.2015" is important to us, you may share it by using the comment box below.